Daine Laurie 2015-16 highlights | Lower Clarence Magpies! Sport AS NSW crushed Queensland in the first State of Origin, earlier in the day a Clarence Valley product showed he may be one to watch for the Blues in the future. News Former Lower Clarence flyer Daine Laurie named in the New South Wales under-18s State of Origin squad for Queensland showdown. 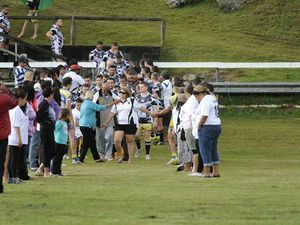 Rugby League From Lower Clarence to the foot of the mountains, Magpies' boom fullback Daine Laurie has scaled the heights to earn a contract with the Penrith Panthers. Sport SCHOOL finishes high-flying year on a high after with an emphatic defensive effort in The Daily Examiner Shield Under-14 Rugby League round robin series.